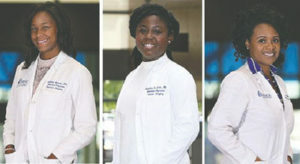 L to r: Dr. Avianne Bunnell, Dr. Kiandra Scott, and Dr. Quiana Kern are surgical residents who have made history as the first Black doctors accepted into their respective programs at Medical University of South Carolina (MUSC). CHARLESTON, SC — For one resident, being a surgeon is an opportunity to ‘fix’ people. For another, it’s a chance to develop long-term relationships with patients and nudge them onto healthier paths. And for a third, it’s helping people reconstruct their appearances after cancer. All three are young, smart and ambitious – that’s a given for any Medical University of South Carolina (MUSC) surgical resident who’s bested dozens, if not hundreds, of other applicants to win a spot in one of the integrated pro-grams that accept one intern each year. They’re also all Black women, which makes them part of an even more select group. African Americans represent between 2 and 10.2 percent of surgical residents, depending on the specialty, according to a January 2017 article in the Journal of Surgical Education. At MUSC, medical doctors Avianne Bunnell, Kiandra Scott and Quiana Kern comprise more than 20 percent of the 2017-18 class in the three integrated surgery programs: vascular, plastic and cardio-thoracic. Integrated surgery programs are five- to six-year programs that take residents directly from medical school, un-like traditional programs that require doctors to complete a five-year general surgery residency before training in a specialty. She liked that she would reach a broad patient population, from children to adults, and that plastic surgeons operate head to toe. Now in her third year of residency, she isn’t sure what she wants to do after residency, but she thinks she’d like to do a fellowship in either microsurgery or craniofacial surgery. For the surgery programs at MUSC, choosing residents is about finding the right fit, said June Cameron, director of surgery education programs. Last year, more than 200 people applied for the plastic surgery residency, 80 for vascular surgery and 150 for cardiothoracic surgery. Each program takes one resident. Though it’s above the national average for its percentage of underrepresented students and residents, the college is slightly below the national average when it comes to faculty who are considered underrepresented minorities – 6.5 percent compared to the national average of 7 percent. Scott and Bunnell quickly noticed the disparity between the percentages at the student and resident level and the percentages at the attending level. It’s a longstanding, multi-faceted problem that academic medical centers across the nation struggle with, de Arellano said. “I’ve been told by many students that they never pictured themselves in that role,” referring to becoming faculty members at an academic medical center, he said. Prabhakar K. Baliga, M.D.,chairman of the Department of Surgery, said diversity and inclusion are integral to the department’s vision. As part of that vision, MUSC is a member of the Society of Black Academic Surgeons and won the honor last year of hosting the Claude Organ Lectureship in African American Medicine. As they endure the long hours and competing demands of residency, the three residents must also navigate the expectations of patients, staff and even themselves. Simply by being in the room with an “M.D.” stitched onto their coats, they’re changing perceptions about what a doctor looks like.